Children in Uganda are orphaned for many reasons. Some are abandoned because their families cannot support them or do not want to care for them, some have had parents pass away, and others have been apart of or witnessed tragic events and are taken from their families for their safety. God calls us to care for one another; even more so, to look after the orphaned and widowed. Your tax-deductible contribution of just $40 a month will provide an abandoned child with a safe, loving, Christian-based place in which to thrive. WHAT DOES MY SUPPORT PROVIDE? Housing – Our orphanage provides a safe, secure place for orphans to live – a place to belong. Nutritious food and baby formula. Medical checkups, which often save lives. Clothing, including diapers, for ever-growing children. Staff – Caring Christian staff members who are committed to loving, guiding, and raising children. In addition to caretakers, we employ cooks, grounds-keepers, security, maintenance, and administrative assistants. HOW LONG DOES MY SUPPORT LAST? When you choose to care for a child, your support lasts as long as you choose or until the child leaves the orphanage. Some orphans are adopted. Some orphans are united with family members who take them in and some will leave when they come of age. You will be notified if and when your child leaves so you may decide how you want to proceed. DOES MY MONTHLY DONATION GO DIRECTLY TO THE CHILD I SUPPORT? Your donation ensures that all of the needs mentioned above are met for your child. However, because the orphanage is a community organization, there are expenses that are not at the individual-only level. For example, we purchase groceries all at one time which requires that we pool donations together to meet the collective needs of all the children in the orphanage. Blessing was rescued and brought to the Hope Center after not receiving proper care from her mentally ill parent. Blessing is a very happy child and is doing very well at the center. Having a 17 year old disabled and deaf mother, Moreen was brought to the Hope Center after not getting the proper care she needs. She is now receiving proper care and is doing well. Kirabo’s mother passed away shortly after she was born and her father is not able to provide care for her. We are so glad that she found the Hope Center! Sharuwa joined the Hope Center shortly after being abandoned by her mentally ill mother. 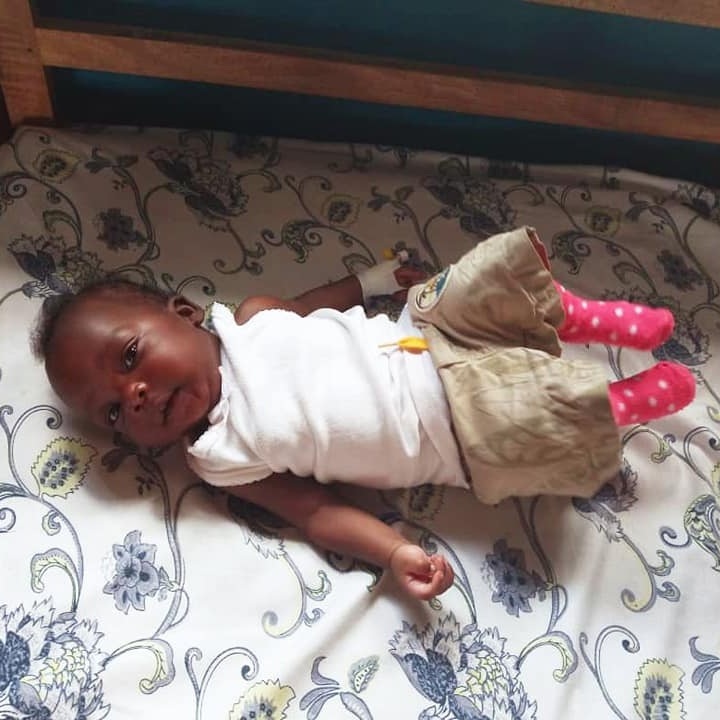 She was malnourished when she arrived, but with supportive care from our team, she is now a healthy, noisy baby who loves eating and being cuddled. Despite being abandoned with a mental retardation, Zachariah is a smart and lovable child. When Zachariah arrived at the Hope Center, at the age of one, he was extremely malnourished and was the size if a four month old. Since arriving he has thrived both in his health and his physical abilities. Zachariah is now learning to walk and loves smiling as well as giving hugs. Timothy was found abandoned in his village. He was taken to a social worker’s office who in turn contacted Hope Center. Timothy is a very sweet little boy and we are working to learn more about him and the family who abandoned him. Simon was brought to the center after having been abandoned without identification. He is an overall very optimistic and happy child. Simon loves spending his time laughing. Mimi was four years old when she came to Hope. She was not only malnourished, but she needed legal protection and care from her father who had tortured her. Not even a year old, Hassan was recently brought to the Hope Center after the passing of his mother. He had been orphaned since his father and other relatives could not provide him the proper care and feeding he needed. Upon arrival, Hassan was extremely malnourished but is now doing well. He is an energetic and adventurous child and is always eager to be on the move. Nagib was recently brought to the Hope Center, after his mother died of HIV/AIDS. He has no other family and was not receiving adequate care. Najib is now receiving proper care and was recently taken to a clinic to test for HIV. The first test came back negative and he will be taken for another test in a couple months. When the Hope Center received Jacob he was seriously malnourished. Despite this, he is now a healthy, brilliant child. Jacob is adventurous, lovable, and confident. Faith was brought to the Hope Center after being abandoned by unknown persons. She has a physical disability which causes a whole side of her body to be completely paralyzed. Faith undergoes weekly physical therapy which has helped her mobility and dexterity. Despite her disability, she is very active, warm-hearted, and positive. She enjoys singing, dancing, and being outside. After being left in the care of his 13 year old aunt and not being given the care needed, Calvin was brought to the Hope Center. He is doing very well in the care of the center, and is quite studious as well as thoughtful. Esther was in need of care from Hope Center when she arrived at the age of two. Esther is HIV positive. Her mother had abandoned her in a house where she was starved and malnourished. Esther would like to be a teacher when she grows up! Jonah was brought to the Hope center, malnourished, after his mother passed away during delivery. After being given proper feeding and care, Jonah is now thriving at the center. He is clever, energetic, and affectionate. He enjoys spending his time jumping, dancing, and singing. Peter Paul was found abandoned along the roadside, where he his mentally ill mother had left him. He was brought to the Hope center shortly afterward. He is very thoughtful and generous but is also very curious and likes exploring. Peter came to the Hope center having been abandoned without any identification. Although Peter has a mental handicap, he is very sweet, hardworking, and friendly. He loves being with people and is very social as well as affectionate. Victor was rescued and brought to the Hope Center after not receiving care from his mentally ill parent. Victor is now thriving and doing well at the center. Gideon joined the Hope Center extremely malnourished and lacking any identification. With care from HCU, Gideon is now doing exceptionally well and is a very calm baby. He is compassionate, loving, and very peaceful. Esther came to the Hope Center with help of local leaders. Esther’s mother is mentally ill and her father is unknown at the time of arrival, so she was staying with her grandmother but that is no longer an option. Without any form of identification, Naiga was abandoned and then brought to the Hope Center. She adores being around people, is very compassionate, and enjoys giving hugs. Daniel came to Hope Center in need of a home. Daniel was living on the streets neglected and abandoned by his father after his mother died. Found abandoned outside of a nightclub, Gift Hope was surrendered to the local authorities who brought him to the Hope Center. Gift Hope is very active and loves everyone. He has a big smile and is a bundle of love and positivity. Miriam, who is only a little over a year old, is already an ambitious, talkative bundle of joy. She recently joined the hope center after being abandoned by unknown persons. Miriam is very playful and she is happiest when outdoors. Moses was found abandoned with a physical and mental disability. He was taken to the Hope Center where he was given care and weekly therapy which has helped his physical strength immensely. Moses is a very sweet and compassionate child who loves being with people. Ritah came to Hope needing immediate medical attention. She has sickle cell and had been neglected and left to her grandfather who was too old to care for her. She is physically disabled and in need of medial attention, care, and support. Asuman was brought to the Hope Center after having been abandoned. He had no identification when he arrived but is now doing very well at the center and is attending school. When her grandmother was unable to provide Annet the care she needed, she was brought to the Hope Center where she received proper care. She was eventually able to go back and live with her family once again. She still attends school and receives an education which is still supported by the Hope Center. Tendo arrived at the Hope Center without a name. He was abandoned by unknown people behind a toilet in a rubbish pit in a village in the Mityana District. A good Samaritan woman heard the baby crying and brought the child to the police. Tendo was found to have infections but tested negative for HIV.